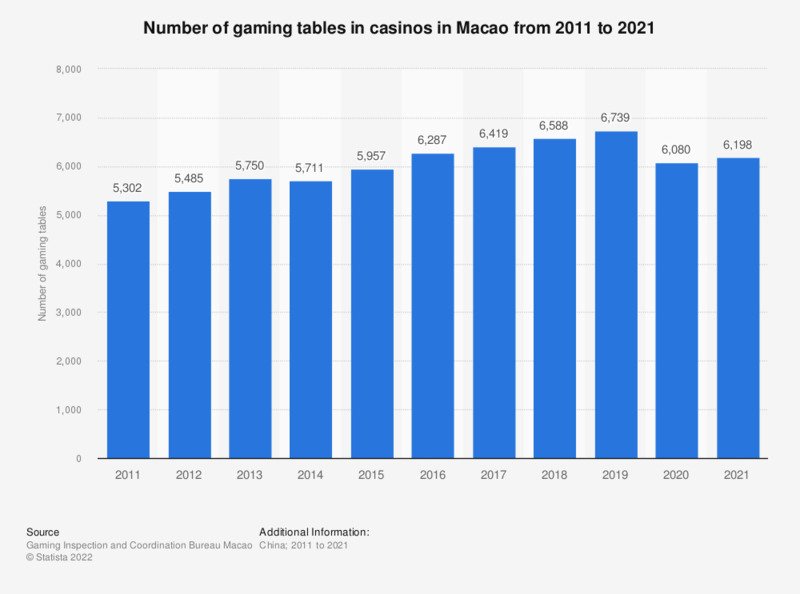 This statistic shows the number of gaming tables in casinos in Macao from 2008 to 2018. In 2018, there were 6,588 gaming tables in Macao. The number of gaming tables in Macao increased by more than 2,000 between 2007 and 2017. In 2017, there were 6,419 gaming tables in Macao. Macao is one of two Special Administrative Regions of the People’s Republic of China and gambling has been legal there since the mid-nineteenth century. Since then, the gambling and gaming industry has become a large part of Macao’s economy, generating almost 33 billion U.S. dollars in gross revenue in 2017, up from just 10.5 billion in 2007. As a result, Macao is now known to many as the “Monte Carlo of the Orient” and the Las Vegas Strip, America’s largest gambling market. In the first quarter of 2018, there were 41 casinos in Macao. Within these casinos, gamblers from all over the world play a variety of games of fortune, including roulette, black jack, baccarat, slot machines, Mahjong and poker, among many others. VIP baccarat, a card game played between two hands, generated by far the most revenue among the games of fortune in 2017 with around 18.6 billion U.S. dollars. There were many more slot machines than gaming tables in Macao’s casinos in 2017. With more than 15 thousand units, slot machines outweighed gaming tables by over nine thousand. Despite being much larger in number, slot machines made significantly smaller revenue than gaming tables at just 1.63 billion U.S. dollars.